England captain Steven Gerrard and Uruguay's Luis Suarez were both wearing football boots from Adidas' collection featuring a new "disruptive" design in their world cup clash last night. 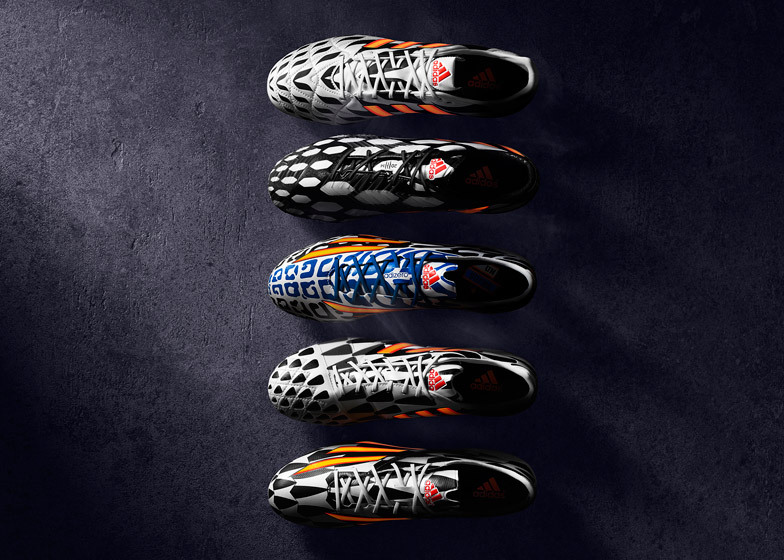 From left to right: the Battlepack 11pro, Predator, Adizero f50 Messi, Nitrocharge and Adizero f50. 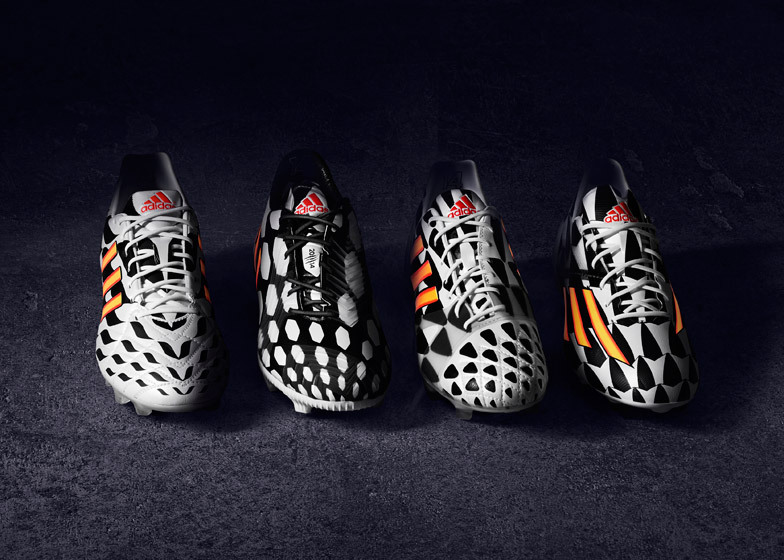 Adidas launched its Battlepack boot collection for the Brazil Fifa World Cup 2014 with five new designs from its existing football footwear ranges, which have been covered in "disruptive" black and white prints designed to make them stand out against the green of a football pitch. Suarez wore the Battlepack f50 Adizero boot, while his Liverpool teammate and world cup rival Gerrard was sporting the Nitrocharge 1.0. Other players wearing boots from the range this week include Holland's captain Robin van Persie and Argentina's Lionel Messi. 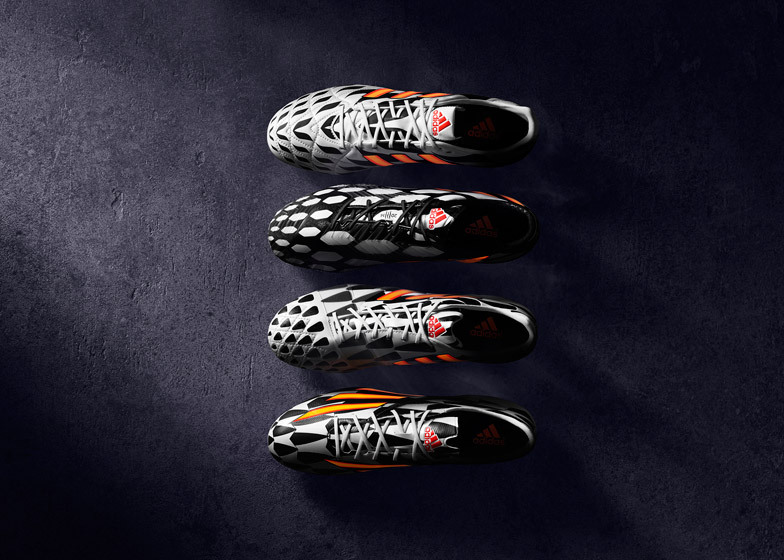 From left to right: the Battlepack 11pro, Predator, Nitrocharge and Adizero f50. "We want the boots to stand out on the pitch – everyone expects a tournament in Brazil to be full of green, yellow and other bright colours," said Adidas' lead developer for the collection Gerald Kuhtz. "We felt this was predictable so we chose to be different with each boot exactly 50 per cent white and 50 per cent black. The black / white design also resembles the iconic Copacabana beach paving pattern in Rio, perfected by Roberto Burle Marx," added Kuhtz. The patterns and colour selections were also influenced by motifs found in the tribal war paint of native warriors from different cultures. 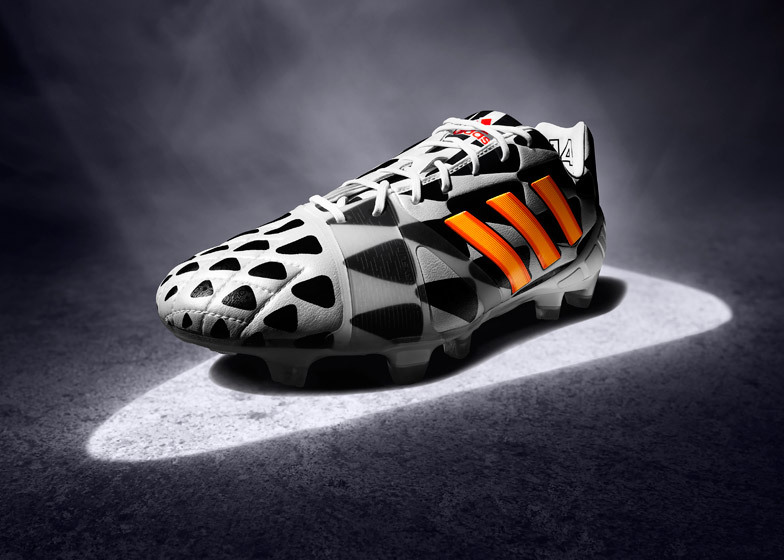 Each boot features Adidas' iconic triple stripe in orange or gold to stand out against the pattern. The colours are intended to represent the gold of the World Cup trophy, and "the fire from the football gods, as the players prepare for battle", said Kuhtz. 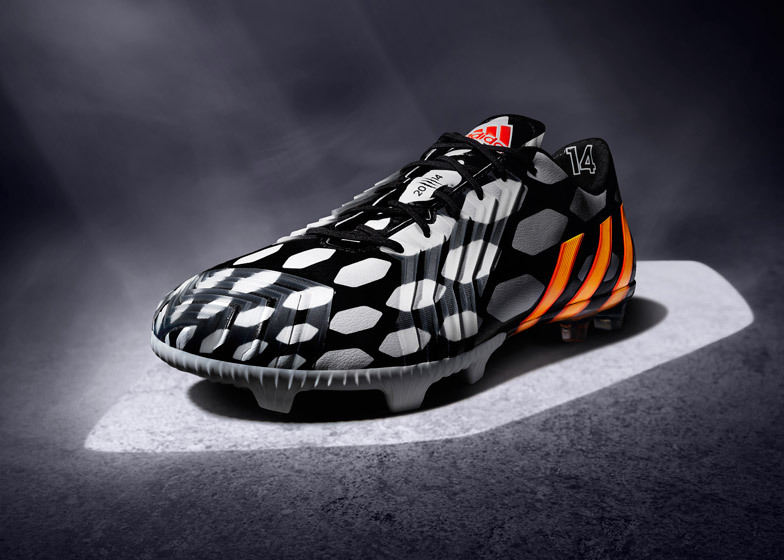 The Battlepack Adizero f50 Messi. 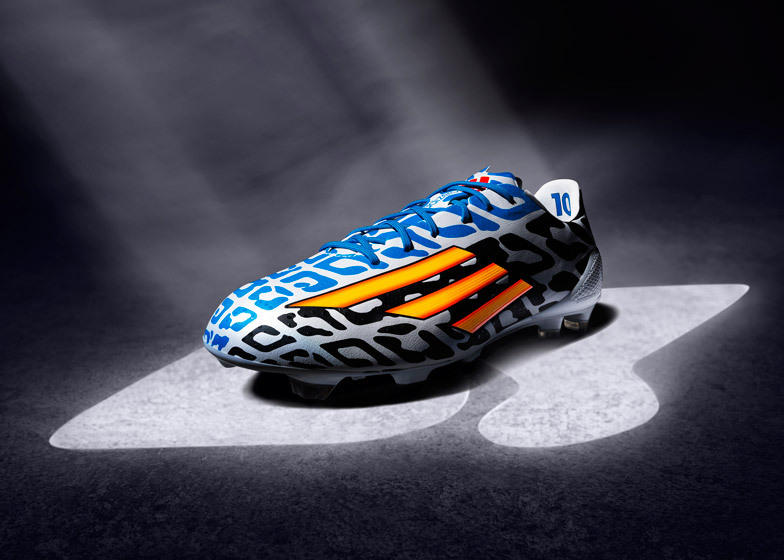 Only one boot in the collection, the Adizero f50 Messi designed for Argentina's Lionel Messi, features a different colour combination, incorporating a pale blue in reference to his country's national flag. The collection has been in development for two years – an unusually long time for an updated range of boots – with project teams based at Adidas' German headquarters and in Portland, USA. Suarez wearing the Battlepack f50 Adizeros. "Predator is the boot with the most new developments, we have added a friction control element that extends to the outsole to guarantee more control," explained Kuhtz. 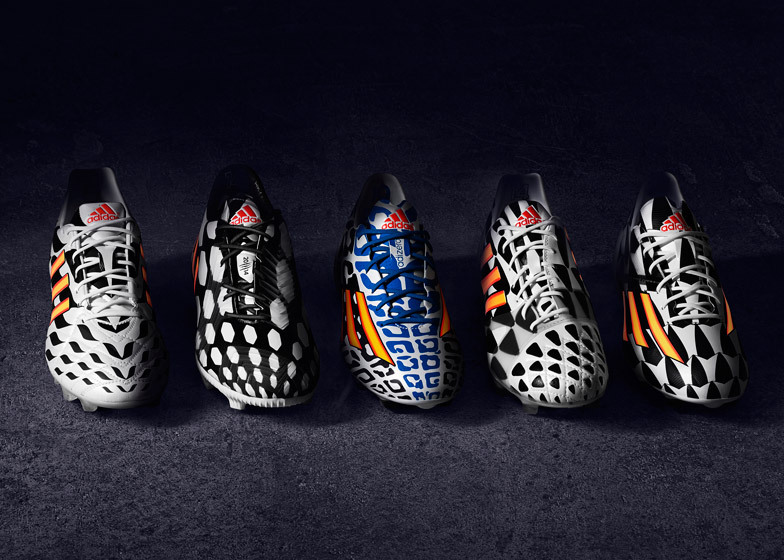 "Also predator is the only boot that is white on black, as all the others have a black on white design. 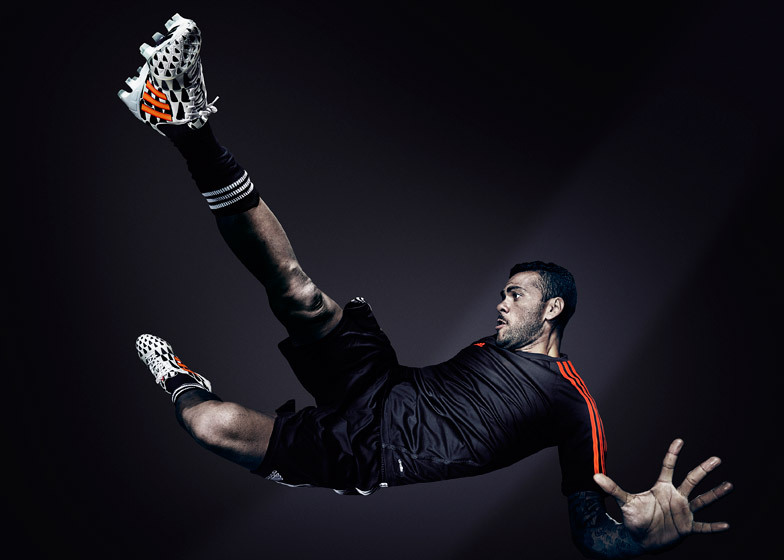 This is in line with our release of a new predator boot at every World Cup since 1994, so it is important to us for the predator to have a point of difference." 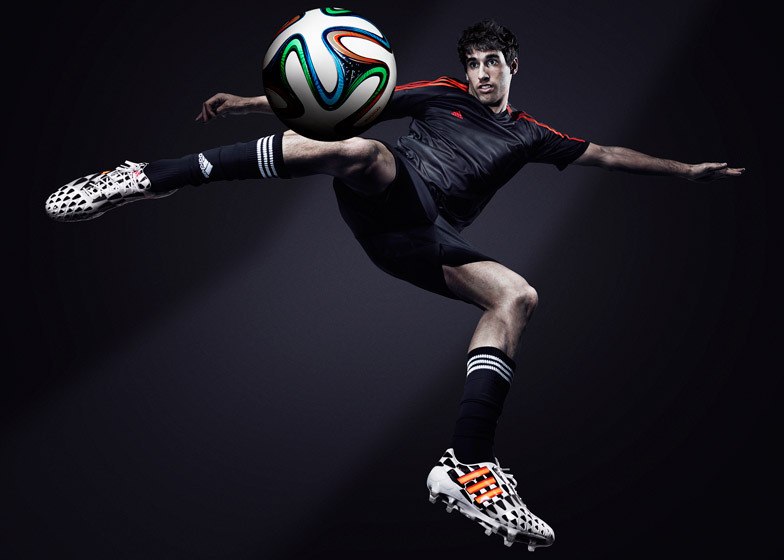 The boots are the latest in Adidas' campaign to reclaim ground against arch rival Nike. Over the last five years, Nike has been reestablishing its reputation as a sportswear leader with innovative projects including the development of its Flyknit technology and the Fuelband wearable activity tracker, and a series of high profile advertising campaigns. "We want the boots to be remembered as synonymous with the World Cup in Brazil and for igniting adidas' new era in football," said Kuhtz. "Our aim is for Battle Pack to be seen as iconic and memorable to all football fans around the world." Adidas has been the official sponsor of the Fifa World Cup since 1970 and still owns a bigger share of the football merchandise market, despite Nike owning a large share of the world-wide sportswear market. Nike's presence at the world cup is unofficial, but this year marks the first time the brand has sponsored more individual teams than Adidas. Nike is also sponsoring athletes to wear its boots, even when the teams are wearing Adidas kits. Earlier this week, England players were spotted wearing Nike despite having official sponsorship from Adidas. Adidas is releasing an app for customising trainers with phone pictures. Adidas is currently preparing for the relaunch of its miAdidas trainer customisation service – a direct rival to the NikeiD initiative – with an app that will allow users to turn their Instagram pictures into prints for their trainers.